One particularly distinctive and well-developed aspect of Uzbek culture is its cuisine. Unlike their nomadic neighbors, the Uzbeks have had a settled civilization for centuries. Between the deserts and mountains, in the oasis and fertile valleys, they have cultivated grain and domesticated livestock. 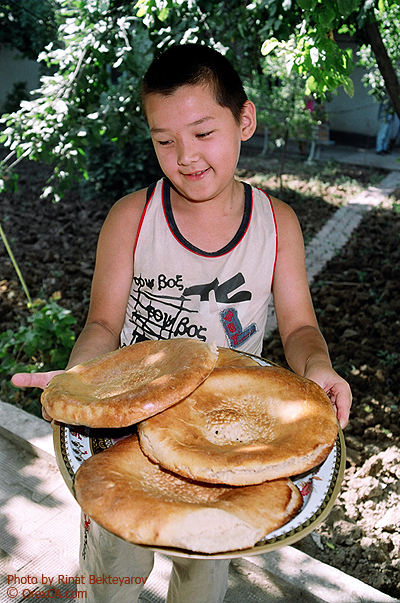 The resulting abundance of products has allowed the Uzbeks to express their strong tradition of hospitality, which in turn has enriched their cuisine. The seasons, specifically winter and summer, greatly influence the composition of the basic menu. In the summer, fruit, vegetables and nuts are ubiquitous. Fruit grows in abundance in Uzbekistan - grapes, melons, watermelons, apricots, pears, apples, cherries, pomegranates, lemons, persimmons, quinces and figs. Vegetables are no less plentiful, including some lesser known species such as green radishes, yellow carrots, and dozen of pumpkin and squash varieties, in addition to the usual eggplants, peppers, turnips, cucumbers and luscious tomatoes. The winter diet traditionally consists of dried fruit and vegetables, and preserves. Hearty noodle or pasta-type dishes are also common chilly weather fare. 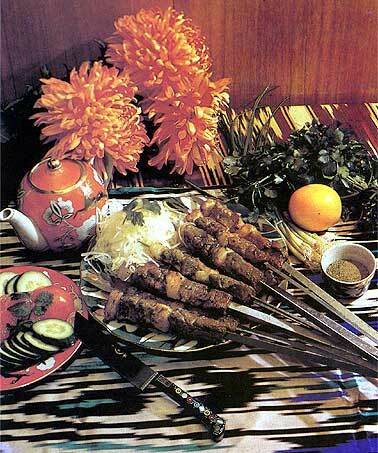 In general, mutton is the preferred source of protein in the Uzbek diet. Fatty tailed sheep are prized not only for their meat and fat as a source of cooking oil, but for their wool as well. Beef and horsemeat are also consumed in substantial quantities. Camel and goat meat are less common. The wide array of breads, leavened and unleavened, is a staple for the majority of the population. Flat bread, or "non", "lepyoshka" is usually baked in tandoor ovens, and served with tea, not to mention at every meal. Some varieties are prepared with onions or meat in the dough, others topped with sesame seeds or kalonji. Central Asia has a reputation for the richness and delicacy of its fermented dairy products. The most predominant are katyk, or yogurt made from sour milk, and suzma, strained clotted milk similar to cottage cheese, which are eaten plain, in salads, or added to soups and main dishes, resulting in a unique and delicious flavor. 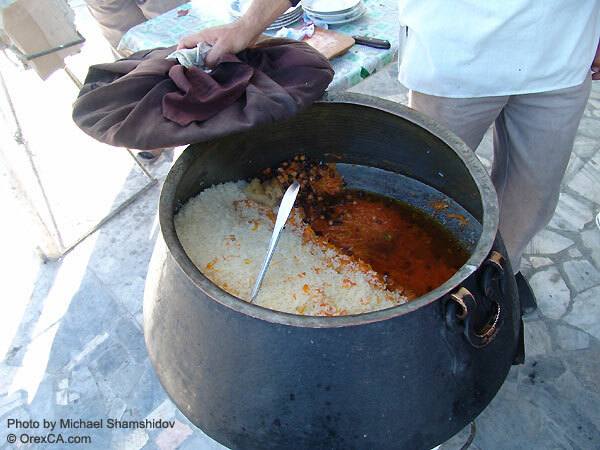 Plov or Osh, the Uzbek version of "pilaff" ("pilav"), is the flagship of Uzbek cookery. It consists mainly of fried and boiled meat, onions, carrots and rice; with raisins, barberries, chickpeas, or fruit added for variation. Uzbek men pride themselves on their ability to prepare the most unique and sumptuous plov. The oshpaz, or master chef, often cooks plov over an open flame, sometimes serving up to 1000 people from a Single cauldron on holidays or occasions such as weddings. It certainly takes years of practice with no room for failure to prepare a dish, at times, containing up to 100 kilograms of rice. Tea is revered in the finest of oriental traditions. It is offered first to any guest and there exists a whole subset of mores surrounding the preparation, offering and consumption of tea. Green tea is the drink of hospitality and predominates. Black tea is preferred in Tashkent, though both teas are seldom taken with milk or sugar. An entire portion of their food culture is dedicated solely to tea drinking. Some of these include samsa, bread, halva, and various fried foods. The "chaykhana" (teahouse) is a cornerstone of traditional Uzbek society. Always shaded, preferably situated near a cool stream, the chaykhana is a gathering place for social interaction and fraternity. Robed Uzbek men congregate around low tables centered on beds adorned with ancient carpets, enjoying delicious plov, kebab and endless cups of green tea.